Find artworks, auction results, sale prices and pictures of Galuma Maymuru at auctions worldwide. Galuma Maymuru (born 1951) Bawu, 2002 natural earth pigments on eucalyptus bark 104.0 x 61.0cm (40 15/16 x 24in). Footnotes PROVENANCE Buku-Larrŋgay Mulka Art Centre, Yirrkala, Northern Territory (label attached verso) Annandale Galleries, Sydney (label attached verso) Private collection, Sydney The Buku-Larrŋgay Mulka Art Centre label attached verso reads: "This sail painting has reference to the cyclical view of Yolngu cosmology and their incorporation of almost 1000 years of Indonesian visitation to their land. The grief felt at the time of Macassan trepangers returning to Sulawesi with Bulunu (the S.E. winds of the early Dry season) is correlated with the grief at the passing from life of a death in the clan. The return of the Macassans with Lungurrma (the Northerly Monsoon winds of the approaching Wet) is an analogue of rebirth of the spirit following appropriate mortuary ritual. Thus the sigh of sails (clouds) on the horizon spurs great emotion. The Miny'tji (sacred clan) design is that of Munurru - the great Yirritja ocean which combines the waters of all Yirritja coastal estates at the horizon. The sailors prepare their three ply bark twine. The triangular motifs are the clouds and the sandhills and the wind of this area. Nyapilingu is a spirit woman who lived in Wangarr times, the Dreaming. 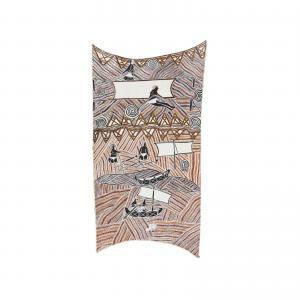 Nyapilingu set out from Ambakamba (Groote Eylandt) in a paper bark canoe and travelled across to the mainland and then north and west as far as the central Arnhem Land coast. Wherever she went she marked the country with her activities. She is remembered by the people at these sites, who sing and dance her story. 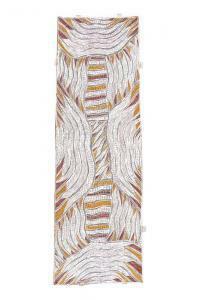 The cross designs in this work are a reference to the feminine possum string girdle worn by Nyapililngu. The maternal Wangupini or Wet Season thunderheads are pregnant with life giving freshwater rain. Marrgnu, the possum spun its own fur into this sacred string. The sacred Marawili tree anchored this string which acted as a line to the reservoir of mangalili souls: the Milky Way. This constellation is an astral form of the Milngiyawuy river which is also this reservoir. The cycle represented in water as well as sail. 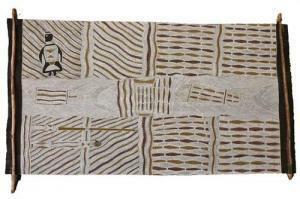 This work was created for the Buwayak-Invisibility exhibition at Annandale Galleries Sydney in 2003."